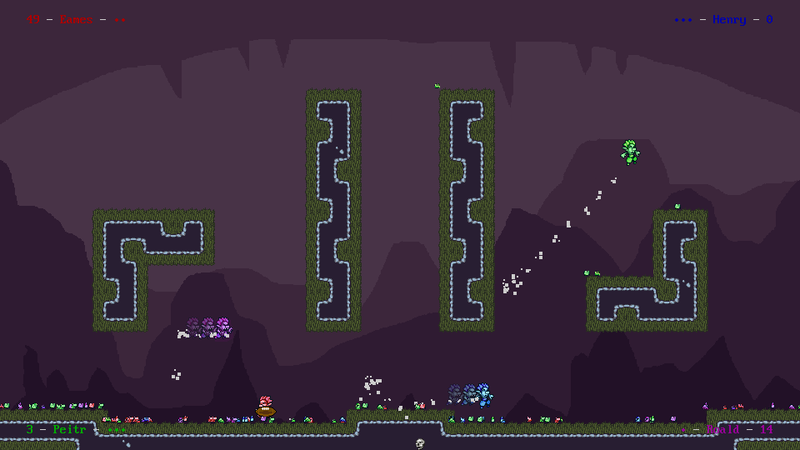 Dash Mob is a local multiplayer dash arena where you score points by dashing into your enemies. Be careful though, dashing at the wrong time causes you to be vulnerable. Dashing into someone who is also dashing will bounce both of you around. 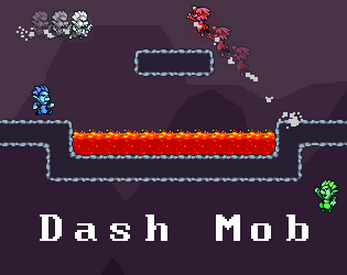 Dash mob has 8 game modes and team options for each! Xbox 360, Xbox One controllers on Windows. Xbox 360, PS4, PS3 controllers on Mac. 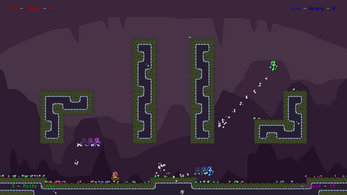 Keyboard (Left/Right to Move, Z to Jump, X to Dash) on all platforms. Requires Adobe Air on Mac/Linux. Added Bots: They are completely random, but are enough to have some fun. Respawn points can be affected by gravity, so they can be placed above destructable blocks. Destructable blocks now spawn particles when broken. Added the ability to flip position when wrapping. 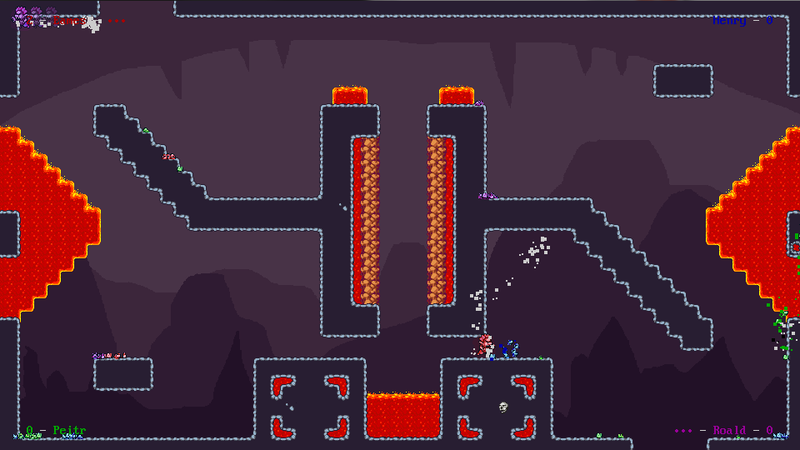 Changed the way tile collisions are done, they are now much more accurate and won't miss collisions with destructable blocks or lava. Added new map: Slava [Normal, Football]. Added new map: The Wave [Normal, Football] (Thanks beanu!). 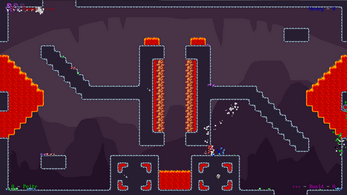 Added new map: Rockslide [Normal, Football]. Adden new map: Gridge [Normal, Football]. Updated some rendering code to support tile variations. All maps updated with subtle scattered rocks. Added a small arrow below each player at the start of the game so you can find your player easier. Player respawn arrow is more visible now. Respawns in Football Mode are faster (same as King of the Hill). Football Mode and King of the Hill mode respawn locations are randomized instead of using the furthest distance from the players. Rules text for the current mode appears at the start of the game. Football and King of the Hill Modes now show scores as seconds instead of frames. Fixed a bug with the scoring screen on Stockwave Mode. Added Stockwave Mode - A mix of stock and wave mode (similar to Gang Beasts scoring). Updated most of the maps for balance and flow. Removed Football Mode from maps that wrapped in both directions. Outside-of-screen arrow now shows when you leave the screen horizontally. Started a Single Player mode, only has a temporary map at the moment. Removed Small and Cardiac maps. 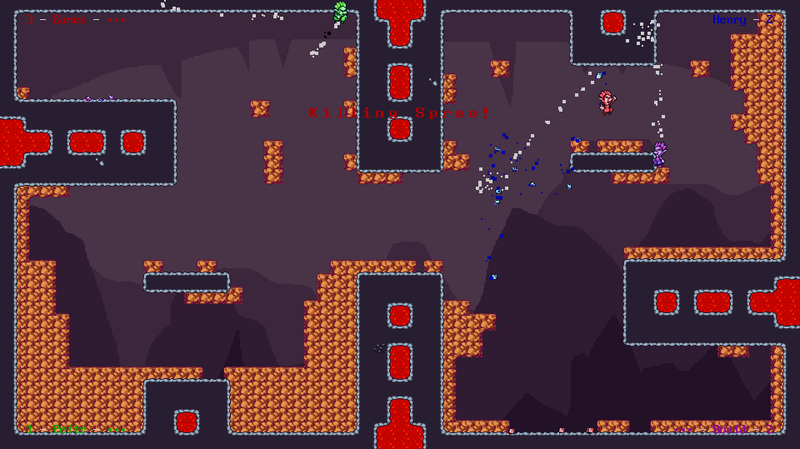 Added new map: Petri [Normal, Football]. If you hold the ball in Football Mode, you can no longer dash and only have 2 jumps. Gatherer Mode kill detection radius is now twice as large. This means if you kill mobs around your zone you get the same bonus as if you were inside it. A small arrow will appear when you respawn to direct your eye to your new location. A small arrow will appear when you are above the screen in Final Destination to show your position and height. Respawns are instantaneous during King of the Hill Mode. Map selection now filters Football Mode maps correctly. Fixed a bug where the pause menu caused the screen to turn white. Added Football Mode - Score points while you hold the football. If you kill the mob holding the football you will grab it from them. 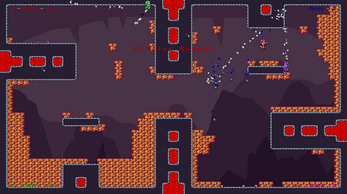 Gatherer Mode is a little faster - Killing an enemy while in your controlled zone adds time. Being killed while in your controlled zone removes time. If you kill a zone controller and the timer is reduced to 0, you instantly gain control of the zone.